It remains unclear just how the large US dealers are expected to generate profits in their role as clearing members for CDS, as we get closer to going live with the the Dodd Frank clearinghouse requirements. And any business that is not profitable runs the risk of shutting down. Since the ICE clearinghouse would not allow anyone but the major banks and the largest asset management firms to become members directly, most clients would still need to go through a dealer even for cleared CDS. But the largest buy-side firms who would qualify to clear directly, are walking away, leaving a small group of dealers to be the only members. Risk.net: - Buy-side firms are unlikely to join over-the-counter clearing houses directly because of additional risks and expense – particularly the need to contribute to a central counterparty's (CCP's) default fund – according to speakers at the Credit Risk USA conference in New York on Tuesday. Typically dealers would charge less than a basis point to clear transactions, yet they would still have to use balance sheet by posting their own collateral with ICE as part of the clearing process. Obviously dealers will have their clients post margin to them, but they will no longer be able to use that collateral for general purposes as they've done in the past. There will also be timing mismatches between dealers posting at the clearinghouse and their clients posting with them (trade date vs. settlement date). Increased balance sheet usage by dealers will be inevitable and the banks are asking themselves whether this business is even worth it. What's more, dealers will continue running credit risk on gross balances as illustrated below. And according to JPMorgan, "gross exposures are likely to increase when central clearing of standardized OTC derivatives becomes compulsory". Increased balance sheet usage and higher credit risks combined with tiny earnings (which after all-in operational and technology expenses may even be negative) is not a recipe for a healthy business. There is anecdotal evidence that Goldman has decided not to offer CDS clearing services at all. Why bother? The return on capital just doesn't make sense for a firm like Goldman which is balance sheet constrained. Morgan Stanley will give it a shot with hopes that clearing will allow the firm to ultimately offer an electronic trading platform for cleared derivatives some time in the future. Many other dealers (like DB) will only offer it to their best clients as part of their prime brokerage business. JPMorgan and Barclays will basically dominate the clearing market in the US. For smaller players in particular, this is a dangerous development because their clearing member bank (CMA) could simply drop them as a client. Without a CMA, this CDS end-user would be shut out of the CDS market. And a smaller firm's ability to sign up to another CMA will be limited and expensive, even if the firm is credit worthy and willing to post proper amounts of collateral. 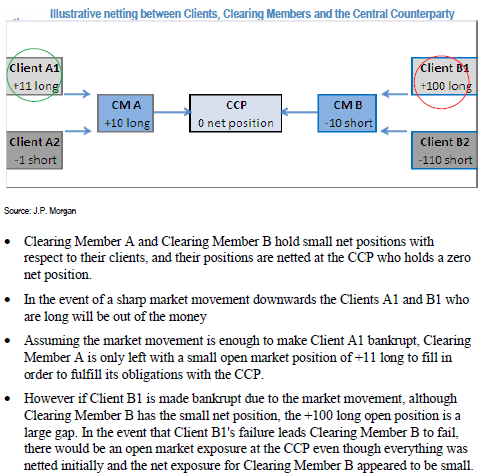 Rather than spreading the risk among a larger universe of players, it seems that this clearinghouse setup will work to limit CDS trading to the larger end-users and a tiny group of CMAs (who have little incentive to stay in this business), adding to systemic concentration and liquidity risks that regulators have been trying to address.